You can reach , a city district on the banks of the Alzette River, by foot from the city center or via an elevator that moves through a cliff into the river valley. A part of the city known for its greenery and slow-moving lifestyle, the district is also popular for its nightlife. You can admire the quaint European facades as you walk past pubs and restaurants. Consider wandering the narrow streets to lose yourself among the tiny boutiques and cafes. The district is small enough to tour quickly. Take a look at our Luxembourg City trip itinerary tool to schedule your visit to Barrio Grund and learn about what else to see and do during your holiday. 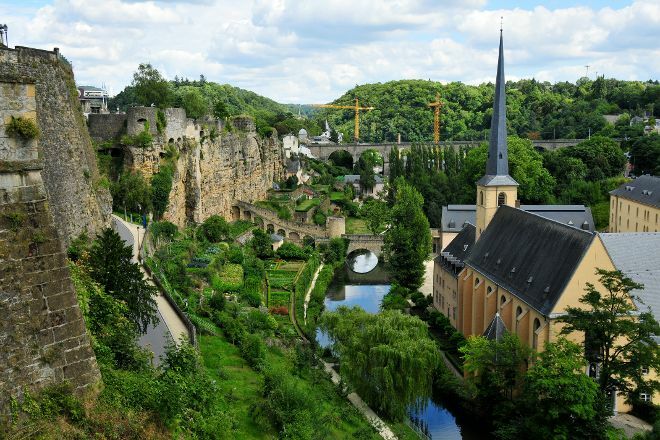 Walking through Luxembourg is encountering a landscape more beautiful than the other. High end down to the lower part (Grund quarter), it seems that you're returning some years. It's lovely!! Beautiful scenery, between nature and architecture. Advisable to walk along the Alzette up to small waterfalls. This is a stunning district, with great views of bridges, water and more. There are plenty of water reflections and it's definitely worth bringing a proper camera to capture them. If the weather's good, it's easy to spend quite a bit of time here. A most magnificent place, oozing with old world charm. The uniformity of the constructions and the harmony with nature seen in Luxembourg City, is hard to beat! Nice and cosy mini city in Luxemburg. Quiet part of town ideal for a stroll. Perfect place to waste the time. The only inconvenience is that the public transport doesnt go directly by train feom Luxembourg and then you can take a bus but the visit is a must. People is charming and polite but you can talk better in french or german instead of English. The lower town of Luxemburg. You can have a very nice walk from the upper town to the lower town, stopping at some view point spots to have great views looking down to the lower town. Then, in the lower town you can have nice walks along the river/creek there. Every day, we help thousands of travelers plan great vacations. Here are some tips on how to use your Listing Page to attract more travelers to your business - Barrio Grund. Promote your permanent link - https://www.inspirock.com/luxembourg/luxembourg-city/barrio-grund-a1190136611 - on your website, your blog, and social media. When a traveler builds a plan from this page, the itinerary automatically includes Barrio Grund. This is a great way for travelers looking for a great vacation in your city or country to also experience Barrio Grund. Promoting your link also lets your audience know that you are featured on a rapidly growing travel site. In addition, the more this page is used, the more we will promote Barrio Grund to other Inspirock users. For best results, use the customized Trip Planning Widget for Barrio Grund on your website. It has all the advantages mentioned above, plus users to your site can conveniently access it directly on your site. Visitors to your site will appreciate you offering them help with planning their vacation. Setting this up takes just a few minutes - Click here for instructions.